Happy winner day! From warm and soothing to bright and happy, you all made this leaf lover one happy gal! Thank you to all who participated in Nance's CAS with Leaves challenge. We were delighted to see so many new players too...welcome! Now, before we get to this week's Headliner, let's see what caught the eye of our Design Team! The depth and dimension Shery achieves with layers of stamped images combined with warm colors and an unexpected pop of black make for one stunning card. I always admire the look of a seemingly random stamped background and Shery makes it look effortlessly beautiful. A perfect sentiment and on-trend sequins complete this gorgeous CAS creation. Congratulations, Shery, you are this week's Headliner! I hope you enjoyed this week's winners...stop by their blogs and leave them some comment love! Then, don't forget to join us tomorrow for Jaydee's special twist on this month' sketch challenge...you won't want to miss it! WOW...THANK YOU SOOOOO MUCH!!!! I honestly don't know how you could even narrow these down there were soooo many truly exceptional cards! Thank you!!! Such an honour!!! Congrats to Shery, love your card! Congrats to the Cuts Above!!! Wow, thank you for choosing my card, Nance! I'm floored and honored and floored :-) Congratulations to Mary, Michelle, Rachel, and Vicki -- your cards are awesome! 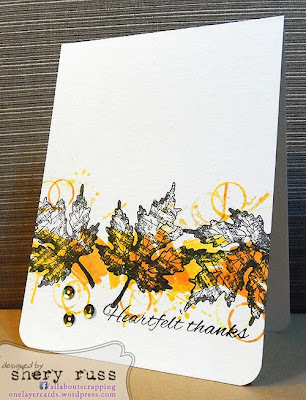 Oh, thank you, LeAnne, for choosing my card! I'm so excited and honored to have my card picked alongside the other gorgeous submissions! Congratulations to all the girls, love the inspiration at The Paper Players! Thanks, Sandy, for choosing my card, I am honored! I loved playing along this week and looking at everyone's blog for inspiration!